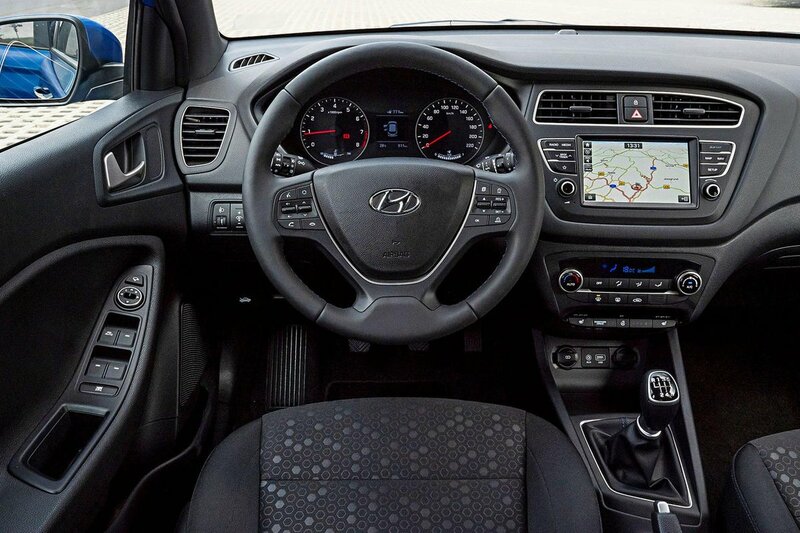 Hyundai i20 Interior, Sat Nav, Dashboard | What Car? Finding a good driving position isn’t hard. The steering wheel adjusts for height and reach, and a few tweaks of the levers on the side of the seat should be all most drivers need to get comfortable. It’s a shame that no i20 gets adjustable lumbar support – even as an option – and you have to go for pricey Premium Nav trim or upwards to get a front centre armrest. The pedals are a little offset to the right, too, although this does leave room for a raised left-foot rest. The touchscreen system and dashboard, meanwhile, are logically laid out and within easy reach of the driver. Visibility is very good in the i20. The front pillars are fairly slim and aren’t overly obtrusive at junctions. Rear parking sensors are standard on SE trim, while you also get front parking sensors on trims above that. Automatic headlights are standard, but SE and upwards also get front foglights, LED daytime running lights and, impressively, high-beam assist. The latter allows drivers to turn on full beam at night, and if the car detects oncoming vehicles or cars going the same direction further ahead, it will revert to dipped headlights automatically. A 7.0in touchscreen comes as standard, with a helpful selection of physical shortcut buttons on either side of the screen and a fairly logical menu layout. The screen itself feels slightly laggy in its responsiveness – especially when using the sat-nav, which is standard on more expensive trims – and it’s generally not as impressive nor slick as the equivalent systems in the Seat Ibiza and Ford Fiesta. 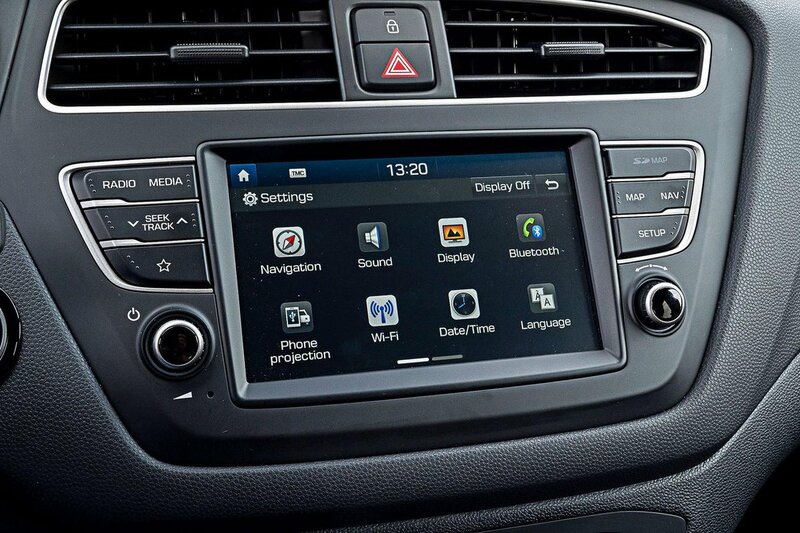 What is brilliant, though, is that Apple CarPlay and Android Auto both come as standard. The i20 feels well put together and gets some soft-touch plastics across the top of the dash, along with some splashes of colours to keep the interior from feeling overly bland. However, it’s still fairly drab compared with its rivals. 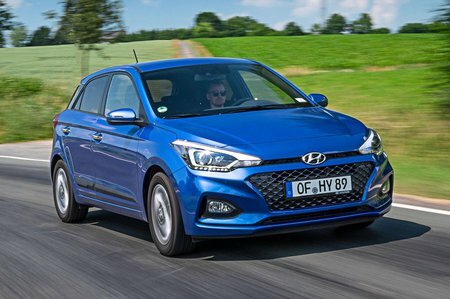 The dials and buttons in the i20 don’t feel as nicely damped as those in its rivals and, generally, the car doesn’t have the same robust feeling inside that its rivals have. The Ibiza, Fiesta and Volkswagen Polo all offer a higher-quality ambience, with better-feeling materials that are nicer to look at.